We are often told we should stop and smell the roses, we ran our annual HMMRC North Island champs weekend just gone and this was a reality check to how great the people we have in this sport making it a great event. We had a pressure cooker event as accommodation was an issue for our out of town racers, someone didn’t consult our club before putting a rugby thing on meaning we had to compress 2 days of racing into one but we were up to the challenge. Everyone pulled finger with jobs needing doing and racer cooperation meant we achieved our goal allowing an early than expected finishing time, giving our faithful out of town supportors a casual drive home. Racing was hectic to say the least. Records were smashed to pieces, which I was surprised as our track has been a tad average over the winter as far as track prep was concerned. 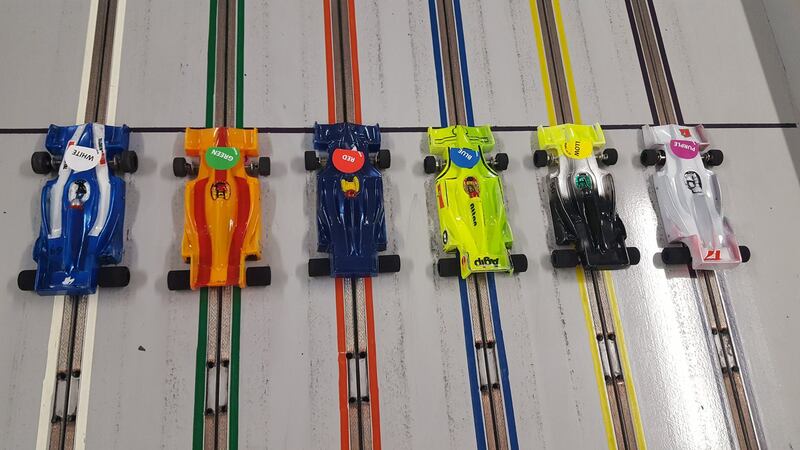 We ran 5 classes: F1,Saloon,LMP,GTP 12, Wing 12. F1: This is one of the first events for many to use the newer F1 JK Cheetah but also permitted to use the older JK F1 which is no longer available, for those using the new chassis it was said to be easier to run but no faster than the old one. I’m sure as time progresses we will get more from it, FK4002 is the motor. Saloon: Between the clubs that support each other we had a gentlemen’s agreement to run the new JK C43 in events we share and this too was the first time many have run a Saloon on them. Mixed results in this one for many most using the NZSCA Saloon body or the Sunset body, again work is needed to find a optimum setup but again I’m sure we will progress over the older CTF but to be fair the CTF also runs a S16D motor as a national class so the car changes somewhat over the 4002. LMP: Again we have adopted the C43 with the C43 chassis and for this event any LMP body is allowed, to give an idea how we have gotten these cars to run our times are pretty much a average GTP12 ! Great racing and somewhat the premier class, word has it many are pretty dam happy with this chassis over anything else on the market it’s easy to setup and racing is much closer than the CTF, again the 4002 is the motor. GTP12: Any Grp12 chassis was allowed as per the bodies these things are hectic to follow finding it much easier at times to follow the timing board. Wing12: Again any GRP12 chassis as per any wing. Now the racing. What a weekend I tell ya. I wasn’t intending to race, my objective was to push the meeting along, but it’s in the blood, so I joined in where time allowed, took nothing seriously and had a bloody ball, many laughs with good people was a great feel good meeting. Racing was so close and it’s all worth a mention but I’ll try to remember what I can, so please forgive if I left anyone out. For me, I like to see people progress, boundaries pushed and leaving our club the wiser is most important, Paul and Chas Le Breton don’t get a chance at their home track to run steel chassis so are up against it however they both did very well progressing over their last visit to our club great effort guys. Bruce Tocker had a hell of drive in Wing12 against Ray Jackson going neck and neck, the last 3min run these guys put on a great show with side by side till the last few seconds with Ray taking the win buy a few segments great to watch guys. 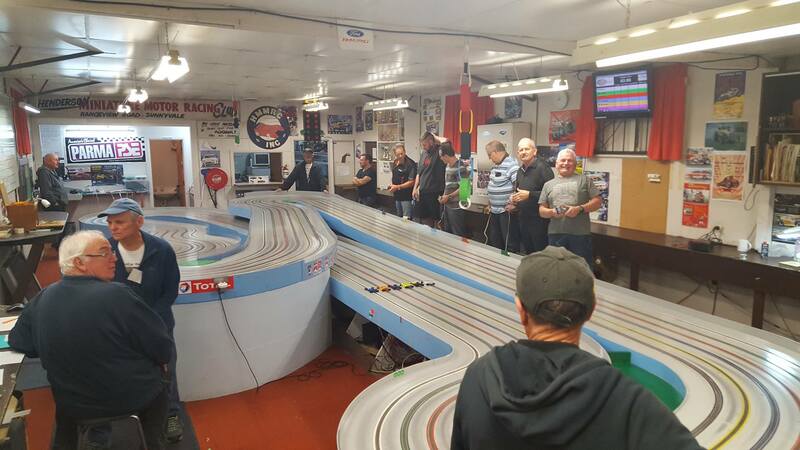 John Crothers is a pretty busy man these days so limited time to race slot cars but he did himself proud, taking home a few podiums and joining the 4.1’s second club which is not a easy thing to do, well done John. Mr Paul Caplan showing up the locals taking some first place podiums and banging out a 4.105 with an LMP ! Stunning Paul, welcome to the 4.1’s club. Darren Mcleod, again taking podiums off the locals and very well deserved too his GTP12 and Wing12 are to be seen to be believed so smooth and fast and just watching put you into a head spin! Awesome racing mate. Kieran Dale, what can I say you da man ! Smashing the LMP record to a pulp with a staggering 4.05 qual lap, a quiet chat with him he’s pretty damn happy with the C43 and firmly believes these cars on our track can go under 4.0’s I’m looking forward to seeing that. 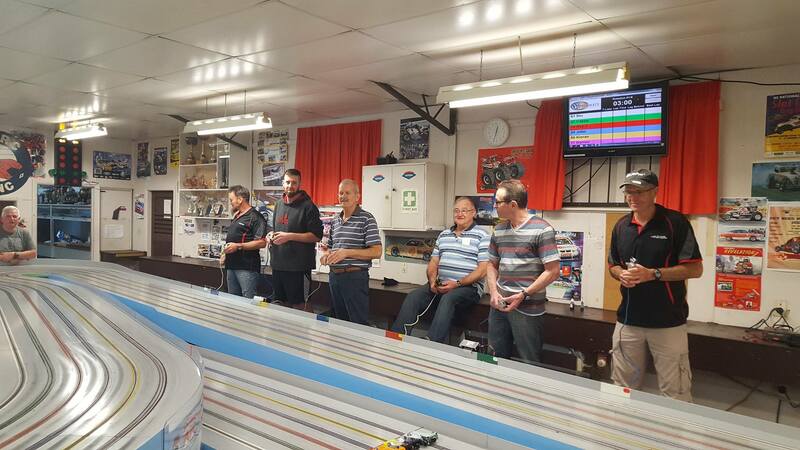 Our club is alive and well with new faces and old ones returning providing great racing and relaxed environment, the future so bright I have to wear shades. Forgive if I’ve left others out it’s a tad hard to run a event and keep up with the finer details, great day enjoyed by all so until next time my your nights be consumed perfecting to your sport !